On-duty NYPD personnel are involved in about 3,900 traffic collisions each year, according to data provided by the department in response to Streetsblog’s freedom of information request. The annual total ranged from 3,783 crashes in 2014 to 4,019 in 2011. In 2015, the most recent year with available data, there were 3,852 NYPD collisions. To reduce injuries and deaths from collisions involving city fleet vehicles, in 2014 the Department of Citywide Administrative Services began collecting and sharing data on such crashes. NYPD was the only agency not to provide DCAS with data, which made it impossible for the city and the public to get a complete picture. 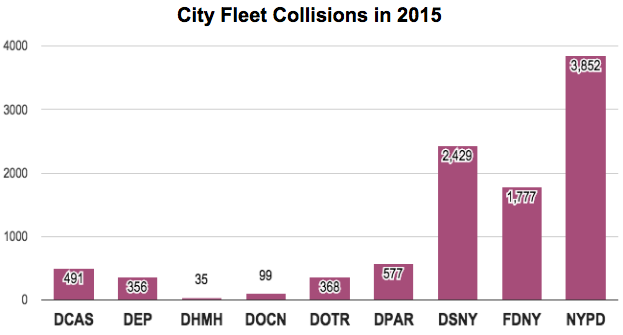 In 2015, DCAS reported 6,132 collisions involving all city agencies other than NYPD [PDF]. The same year, NYPD reported 3,852 collisions, or 38 percent of all crashes in the city fleet. That is somewhat higher than NYPD’s 33 percent share of all city vehicles. It’s unknown how many police collisions result in death, injury, or property damage. Annual reports from the city comptroller’s office consistently show that NYPD leads city agencies in legal settlement claims, some of which stem from vehicle crashes. That’s as close as the public gets to gauging the human toll of NYPD traffic collisions, including police chases that kill innocent bystanders. With NYPD involved in more collisions than any other city agency, the department should open the books on police crashes, and let the public know how it plans to get those numbers down. Thank you for working so hard to get this information, Streetsblog! It’s unacceptable that it wasn’t released in the first place. Thank you Brad. As you know my son Jack was killed by an off duty NYPD. There was another fatality by an off duty NYPD just 2 weeks before Jacks crash in a crosswalk. The public needs to know how frequently the injuries and fatalities are caused by those who drive for a living. Of course these are considered accidents even when they cause death and injury or involve reckless driving. How can NYPD be expected to enforce traffic laws and mitigate one of the greatest sources of danger in the city if they themselves refuse accountability for reckless driving? Recently a police officer was killed in a reckless driving incident. The driver, a police sergeant if I remember correctly, survived. What kind of investigation took place? The survivor should be facing criminal prosecution and jail time. Instead there was probably zero accountability and no investigation. It’s absurd, and as always Streetsblog brings this absurdity into the spotlight. Great Job. NYPD needs to get out of their cars. A first step might be to eliminate 90% of police vehicles in all Manhattan precients below 72nd. Or we could simply insist that police officers who choose to drive to work park their personal vehicles legally. Under Federal Tax law the benefit of parking offered by the city should be taxed at income tax rates. About $200 per month should be withheld from every NYPD who drives into employment into Manhattan to comply with federal tax law. So it could easily have been an MTA or UPS driver, then. Except it wasn’t. It was NYPD Officer Steven Oquendo.